Asinine home remedies for medical problems appear in some of Daumier’s prints. 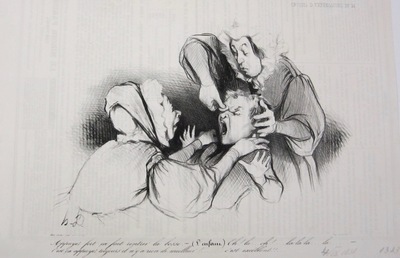 Here, two women apply hard pressure to the lump on a young child’s head to make it go away. Although experiencing considerable pain, the child cooperates with the senseless treatment. Folk-medicine practices, which were often ineffective, sometimes had painful consequences in Daumier’s day.